has mergered with the Charlotte MLS (CMLS)! Hickory, NC Homes and real estate for sale by Price Range. 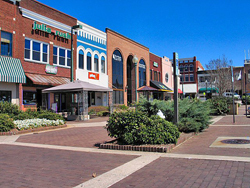 Hickory, North Carolina, a medium sized community is located on I-40, about 55 miles Northwest of Charlotte. Take Exits #123 to #126 on I-40. Property Types for Sale by Price Range. Click on links for interactive maps!